NEXT-GEN MAZDA 3 HAS ARRIVED AT WERRIBEE MAZDA! Come into Werribee Mazda to experience the NEXT-GEN MAZDA 3 and discover exceptional craftsmanship, the excitement of cutting edge Skyactive Technology, exhilarating design and the latest in safety technology. With all the power you need New-Look BT-50 is as much a workhorse as a weekend warrior, the Dual Cab BT-50 is built to tackle any task, and do it all in style with a new bumper and satin black grille. 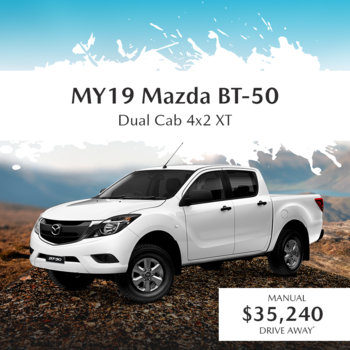 * Recommended promotional Driveaway price for 2019 Mazda BT-50 4x2 Dual Cab Utility XT manual. Private Buyers only. New-Look BT-50 Dual Cab Utility XTR is loaded with features. Fill it with gear, pull a load or take it off road it's always up to the challenge. 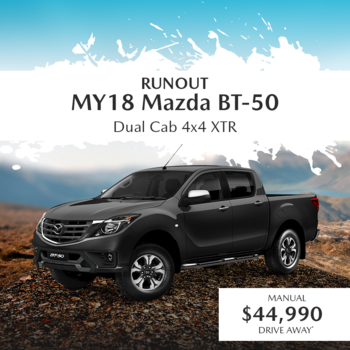 *Recommended promotional Driveaway price for 2018 Mazda BT-50 4x4 Dual Cab Utility XTR manual. Private Buyers only. New-Look BT-50 Dual Cab Utility GT makes it hard to believe you're in a ute. Useful driver tech like Reverse Camera and Satellite Navigation provides convenience, while luxurious finishings complete the package. 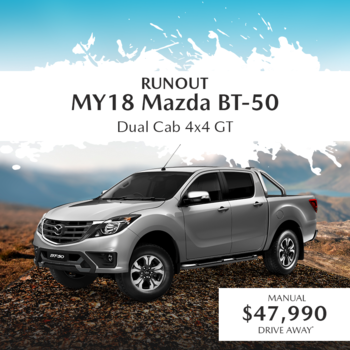 *Recommended promotional Driveaway price for 2018 Mazda BT-50 4x4 Dual Cab Utility GT manual. Private Buyers only.